I inherited this Shriner Masonic Claw Pin and I want to know more about it. 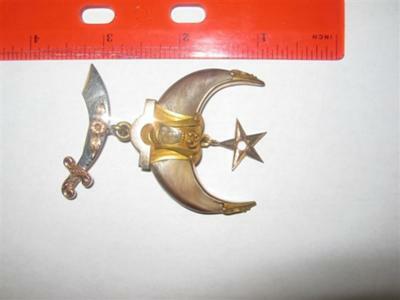 It is just under 2 inches wide and 2 1/2 inches tall, including the sword. It is stamped 14k gold on the back of the sword. The claws look like real claws, but I am not sure. There is a Leys engraved on the piece. We have seen others on the web, but none of them are as large as this one. It weighs in at 23.2 grams total weight. Can you give us any more information on it? Hi, Janice. For your protection, I have removed your email address from this post so you are not picked up by spambots and subjected to a slew of unwanted spam. If anyone has a duplicate of this pin, please feel free to take a photo of it and let us know more about it. Thanks for sharing it with everyone, Janice! You may want to bookmark this page and check back every once in a while to see if anyone has written in about it. 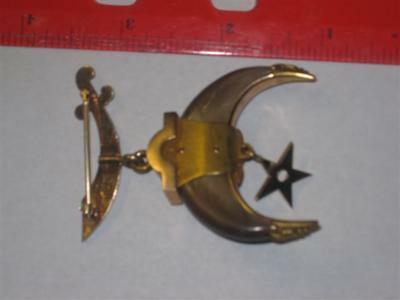 A reputable jeweler in your area may also be able to give you an idea as to the worth of this Shriner Masonic Claw Pin. It is a Past Potentate Jewel for the Shrine. I have one similar. The claws on mine are actually of animal origin. Either Eagle claws or Tiger claws. It is worth quite a bit of money. I found mine in a pawn shop over 25 years ago. If the Scimitar or Sword as you call it, was not there it wouldn't be a Past Potentate Jewel. Its purpose was as a Watch Fob.